Plans for a new dual carriageway cutting the Peak District National Park in half – that’s the latest plan from Transport for the North and Highways England supported by Sheffield City Region. We urge them to drop the idea and plan for managing the traffic and developing rail capacity for both people and freight. 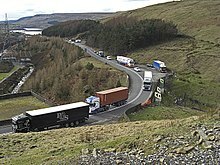 Now that the long tunnel under the Park has been abandoned as too costly, the plan is now to wident the A628 Woodhead Pass into an expressway, a 2 or 3-lane dual carriageway, connecting the M67 and M1. Even with a 5-6 mile tunnel under the most challenging terrain, an expressway would destroy habitats and tranquillity, increase carbon emissions, increase air, light and noise pollution, and add new intrusions on these beautiful landscapes. It’s in Longdendale that the National Park Authority with its partners such as Moors for the Future, United Utilities and National Grid, has invested millions of pounds in enhancing scenic beauty, carbon storage and habitats, and in the removal of eyesores. The environmental insult does not stop at the Park boundary. The Longdendale express-way would continue east across South Yorkshire to the A1M, M18 and M180 cutting across some of the most beautiful limestone landscapes. In 50 years the decision makers have not yet learnt that the provision of more road capacity does not deliver a stable situation – the more capacity is increased, the more capacity increases are ‘needed’, as recent CPRE research has shown.